Jungle Red Writers: A Special Place in Paris--Oooh, la la! HANK PHILLIPPI RYAN: Gosh, how many manuscripts from other authors have I read? For blurbs, or for contests, or whatever. And some of them are great, and some are meh. And some are pretty awful. But from time to lucky time, there’s a manuscript that’s enthralling. Captivating. Fabulous. A manuscript that makes me pick up the phone or open my email to tell the author—I absolutely LOVE this. That is exactly what happened when I read Lark Brennan’s earlier version of what was then called Deyrolle. (Isn’t that what it was called, Lark?) And I might be mis-remembering this, but I don’t think the contest even revealed who the author was, so I told the contest admin to let her/him know I was instantly their biggest fan. That was a while ago, and many things have changed. But not how much I adore this book! Its different, it’s quirky, you would not predict it to be my cup of—anything. But look at these photos! Look at this story! Oooh, la la! I know we’re having kind of a Paris theme this week, and talking about traveling solo--unplanned, but that’s the Jungle Red magic. Thank you so much for inviting me to Jungle Red, Hank! I’m honored to be with such talented authors! The first time I visited Paris I wasn’t yet 30 and was traveling on my own. My college French had already become a bit rusty but something about the city and its people made me feel that I belonged there. Since then I’ve visited the City of Lights so many times I’ve lost count. Still, I love Paris in all its moods and seasons, especially a neighborhood that’s begun to feel like home. This is where the most obscure famous place (or is that famous obscure place) in Paris—Deyrolle—inspired me to write IRRESISTIBLY YOURS. 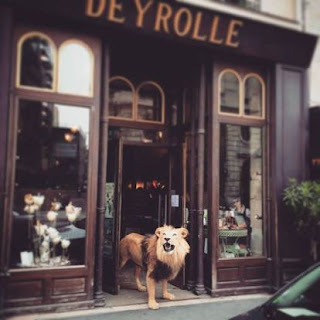 Deyrolle isn’t much from the street, just a quaint garden shop. 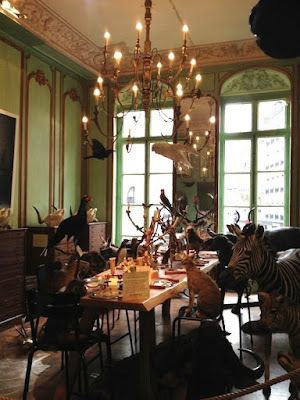 But when you climb the stairs to the second floor you discover an elegant townhouse filled with the most amazing collection of taxidermy animals—everything from elephants and lions to horses, llamas, chickens and mice--that looked like they froze mid-party. I was so charmed, I imagined the owner of the collection could bring them to life when no one was there. Et voilà! That man became Adrien Durand, a powerful telepath who had inherited the establishment and unusual responsibilities, not to mention a vast international business empire which is in deep trouble. In spite of the animals, IRRESISTIBLY YOURS is anything but Night at the Museum meets Doctor Dolittle. Rather it’s the story of deceit, betrayal, international intrigue and a man with dangerous enemies determined to destroy him--including a mysterious woman from Adrien’s past. And if external forces aren’t enough, Adrien is also dealing with tricky Durand family dynamics and an unwanted connection to Tate, a beautiful American with psychic abilities of her own. While I was working on the book, my husband and I had the chance to rent an apartment a few doors down from Deyrolle. I found myself weaving the fabric of the neighborhood into the story and using some of my favorite places for key scenes. For example, Tate’s future is sealed—unbeknownst to her and Adrien—as they stroll past the cafés on Boulevard Saint Germain to the Bel Ami Hotel where she’s staying. After luring kidnappers into Adrien’s trap, the Durand cousins meet up Chez Papa Jazz Club with its graffiti walls and live music. To make up for behaving rudely earlier, Adrien would, naturally, take Tate to dinner at Le Jules Verne on the second floor of Eiffel Tower to apologize and the course of their relationship changes there (the private elevator to the top is fictional as far as I know). And where else in the Louvre would Tate fall into a trance but the exotic Egyptian wing with all its ancient artifacts? I also ventured outside the city for inspiration. 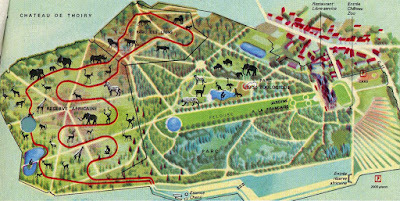 A few years before I started IRRESISTIBLY YOURS, I’d visited the Parc Zoologique et Château de Thoiry about 20 miles west of Paris and loved seeing all the animals roaming free. So when Adrien and Tate use animal telepathy to rescue a pair of white lions from explosions during a concert, they take them to Valtois, the Durand family’s estate and animal sanctuary for wild and exotic animals. I never intended the book to be a Paris travelogue, and it only touches on a very small part of the city. But it does share my love of the streets and places in a neighborhood of the old section of the Left Bank. I can only hope that readers will feel a little of the magic of my special corner of Paris. HANK: Wait—Susan, are you going to Paris soon? Or someone? How can you resist a visit here? Did you all even know this existed? What do you think of it—fabulous? Or bizarre? Or both? And the amazing Lark is giving away a copy of her book to one lucky commenter! Adrien Durand, one of the most powerful telepaths in the world, was born for a life of action and intrigue. But his father’s sudden death forces him to return to Paris to take over his family’s business empire and control the source of the Durand family’s psychic abilities. When American empath Tate Fulbright walks into his world, he suspects she's a spy for the Durands’ enemies. Even more disturbing, however, is the mysterious energy that flows between them, forming a psychic link he’s powerless to break. Adrien’s life begins to unravel when an unknown enemy tries to abduct Tate, and threatens his family and his freedom. Just as it seems Adrien and Tate might have a chance for a future together, the danger gets up close and personal—and deadly. Lark Brennan's love of reading, writing and travel has led her to a string of colorful jobs and a well-worn passport – as well as a few years spent sailing and diving in the Virgin Islands. 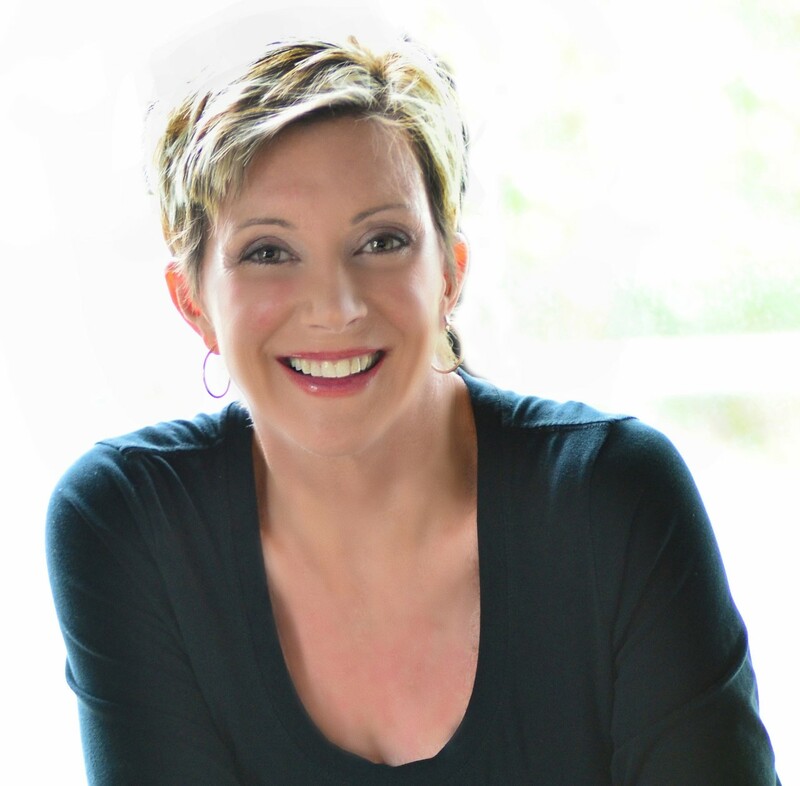 Her travels have inspired the Durand Chronicles, a romantic suspense series with a psychic twist, which take place in some of her favorite places--the British Virgin Islands, Paris, New Orleans and Scotland. Dangerously Yours and Irresistibly Yours, are the first two books of the Durand series. Recklessly Yours will release in early 2017. When not traveling, she lives in Texas with her brilliant husband and her two adorable canine children. Wow . . . I’ve never been to Paris, Lark, but you certainly make it sound special. Congratulations on your book . . . I’m looking forward to reading it. A book that's a travelogue for Paris sounds lovely. If only you could add scratch-and-sniff for all the great food. Did you discover any great bakeries during your "researc"? I am still picturing the moment when you see the store for the first time! And those animals are for sale? Lark, what is it like to live in Paris? wow never been to Paris, but you make me want to visit! thanks for the interesting article. the book sounds wonderful. I think I would like to see those taxidermi! MAY I just say, dying of jealousy with the Paris theme this week! Welcome Lark---as Hallie said, would love to hear about what you thought as you came into that quirky store. And how smart to rent a place on the same street! Lark, I think weaving the story in with the setting is what makes it come alive. Your characters become real people who interact with their beautiful surroundings in real ways. I can't wait to read Irresistibly Yours! This sounds like an intriguing book that I'd enjoy reading. I certainly enjoyed reading about the inspirations for the book. And Yes, I have a trip to Paris in the works. Not until next year, but you better believe this is a place I will not miss!!! We have a darling little apartment all booked that we're staying in. It was rented by a friend just a few months ago and comes with very high praise. And the owner is a friend of Danielle Steele. Thank you for finding this treasure and sharing it with us, Hank. And thank YOU, Lark for finding this exquisite little gem and sharing it in your writing. Going to order it right now, but that's not to say I'd turn down a gift copy should I win! Heavens no! One for me, one for the girlfriend I'll be traveling to Paris with. Thanks for such a warm welcome, everyone! My husband and I wandered into Deyrolle on a cold, rainy January day having no idea it was more than a warm, dry garden shop. The clerk told us to go upstairs and at the top was a cut in the wall with a horse's head poking through (the rest of him was on the other side of the wall). We were startled to say the least, but the real shock was when we stepped into an elegant dining room set for dinner with china and silver and the guests were donkeys, llamas, zebras, a wolf and monkeys positioned as though they were about to be served. 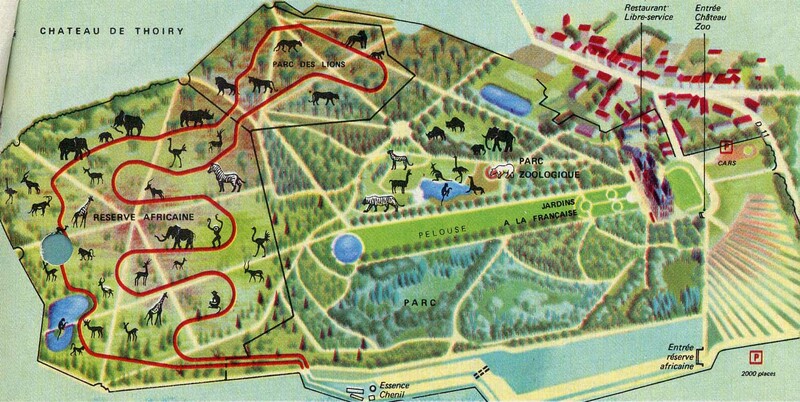 The scene was so playful, charming and absurd, I fell in love with Deyrolle and the animals then and there. The first scene in the book where Tate first sees Maison d'Ermonie is much like my reaction--minus Adrien Durand, of course. And, Hank, living in Paris, even for a short time, was magical. Everywhere you go you make new and wonderful discoveries. Even a fish shop, or cheese shop, or boulangerie is an adventure. And we've met so many lovely and friendly Parisians--contrary to the pop-wisdom that they're rude and unpleasant. I'd love to live there full time, but that isn't possible for now. Love these insider musings on Paris! I was there on a tour after studying for a quarter in college in London. It's all fuzzy now but I remember sitting on steps eating long French bread, and cheese, and shopping for gold in that famous shopping area. Congrats on bringing a great city to life in a book! Living in Paris is my idea of perfection. I've been to Rome and London and various other cities and towns of Europe, and I've lived all over the U.S. In my humble opinion, Paris beats them all. Lordy and I don't even speak French! However, I've never been to Deyrolle. Where's that bucket list pen? That is quite an intro Hank gave you! How can we help but be interested? Lark, thank you, love your wanderings while writing, your views into side streets and secret places. I can't wait to read this series. But, I think I will have to put a plain brown wrapper on that cover...like Mary and Hank this cover would make me not want to pick up the book. Hope you'll be back at Jungle Reds! Hank, I get what you mean about transcripts. I feel that way about books too. Lark, I visited Paris for 2 and half days as part of my tour with a 14 day tour of Europe. We saw the Louvre and ate at Le Bosquet. Loved the Kir Royale drink, goat cheese salad and salmon. Love your map. When I visit Paris, I will bring your book with me. I also love the photos. Your book cover looks like a romance novel :-) When I visited cheese shops, I noticed more goat cheese than cow cheese. Love goat cheese! People in Paris seemed to understand my sign language. I grew up watching French films with English subtitles. Recognized some places from the films. The signs are in French so it is helpful for me to know the language. Look forward to reading your Durand series! Lark, how fun that we're having an unintentional Paris week! And your book sounds enchanting. Should your books be read in order, and can I start with this one? Unintentional Paris! Dibs on that title. And oh, I never saw the cover when I read the ms..so I read the manuscript with no expectations! So Lark, though, are those for sale? Or just--unexpected decorations? It is SO weird, I'd adore to see it in person. And look at that decor--the walls and the paint..oh. SO fab. I love the 5th Arrondisement and the Left Bank! But when I realized I had a French story blooming in my head, I set it in a small town in Burgundy. for the second, I'll be going there again to see what it looks and feels like, what special foods are offered in the run up to Christmas, and how people celebrate the holiday. But I will definitely schedule a day or two in Paris - how can anyone go to France and not?! Lovely French commentary here this week. Merci beaucoup. Sarah, that's so interesting..you and Lark have been on quite the writing journey! Tell us more! Deborah, the books are a little better if you read them in order, but the first two completely stand alone. And they have totally different settings so you can decide whether you feel like visiting the British Virgin Islands or Paris. Hank--At Deyrolle the animals can be purchased but they more often rented for specific events. Hotel Trianon Palace Versailles used them as part of their Christmas decorations last December and they were spectacular. In the book they aren't for sale--for obvious reasons if you read the story. Susan, Burgundy is such a lovely place to set a book! Great choice! I didn't pay a bit of attention to the cover. I had to go back and look. The Durand Chronicles sounds marvelous. I have to read them. I love the mix of paranormal and suspense. Thanks Hank for inviting Lark today! Sarah and I met through RWA as green authors--both working on first books that ended up under our beds for good reason. Since then our journeys have pretty much tracked--we got agents around the same time, sold our first books within months of each other and now have 2 books out each. We lived within a couple miles of each until she moved to Florida a couple years ago. Although we use to critique during the writing process, we now only do so after we've "finished" a polished version. It's great to have a trusted reader who will call you on all the things that don't work and make you fix them before your editor gets the manuscript. Isn't it great having a wonderful critique partner, Sarah and Lark? I love how things happened for you both around the same time. That happened with my critique partner, and we even share the same agent. Love your cover, Lark. The book is on my Kindle, and I swear I'll get to it soon! Hi Sandra! Hope you get to Paris! It's a lovely city with so much energy. I love your book's premise! So cool. I've been to France -- Chamonix, even skied the Alps, but not Paris. On the huge bucket list! Paris is such a beautiful place. It's almost exhausting to try to take in the beauty, because there's just so much of it. Your eyes don't know where to look. The first hotel room I stayed in was on an upper floor, with windows overlooking a building across the street. I had to take pictures of the six different kinds of chimney pots on this one building, all fabulously shaped. Even the vegetable stands outside the stores are so artistically arranged, it blew my mind. Here I just got back from Europe and the Reds are stirring up my wanderlust again! I'll just have to read the book and imagine myself there. Wow! I can completely see how you drew inspiration from this quaint, quirky, and mystical Parisian shop, Lark! What an amazing story! And equally amazing you had the opportunity to fully immerse yourself in Paris. Google is great, but experiencing the cultural nuances first hand is waaay better! Plus CROISSANTS! CHAMPAGNE! CHOCOLAT! What's not to love??? Well, I find the cover most intriguing. Lions immediately get my attention. I see this cover and want to know why there is a lion in the door of a shop. Of course, hearing about the story and back story behind the cover make the book irresistible. Lark, I believe you will have a hit on your hands. I've never been to Paris, but with all the Paris talk swirling around this week, I may have to start looking at that. And, renting an apartment there sounds divine. I'm trying to start planning a trip to England and Scotland, and I'm wondering if renting places for days at a time is something I need to look into. So sorry, Hank. Someone else said something about the cover that made me think you had. One of the beauties of e-books is we tend not to be influenced by cover images--which are sometimes more about the publisher's marketing prospective than the content of the book. That said, I love the tone of most mystery/thriller covers because they're so intriguing. Kathy, I highly recommend renting a house or apartment as a home base if your're planning to be in an area for a week or more. You get to live like a local and have a cozy place to curl up with a cup of tea or a glass of wine after a long busy day. There are lots of websites these days that allow you to do this safely and to pay by credit card instead of wiring money into a stranger's account like we use to do. Lark, your book sounds so intriguing! I visited Paris a long time ago. A friend's exchange student showed us around, but we were only there for three days, so I know there is so much more to see and experience than time allowed. I just finished edits on a book set in the French wine country, so I'm really into everything French right now. I'll definitely pick up your book. I've never been to France, but your description of this section of Paris has me intrigued! I can't wait to read your book and see you bring these locations to life! So agree about the covers of e books. It is a whole different ballgame! And tiny little images don't work anymore, right? Terrific book, Lark. I'm really enjoying the series and looking forward to the next one--but it will be hard to top those animals! What a fascinating inspiration, Lark! How could that lion in the doorway NOT spark a writer's imagination? I love where you went with it. I gotta admit I'm a little jealous: you got to LIVE in Paris while you were writing the book. How cool is that! Lark, you love story of Paris comes through loud and clear. What a cool way to use it in a book! Thank you so much for having me, Hank! And thanks, everyone for stopping by and saying hi! What a fascinating post, Lark! I'd never heard of Deyrolle. Your book is moving higher up my TBR pile. Now I've got to read this book. Paris is one of my favorite cities (and everyone else's I know!). But I love the concept of Empaths-- being able to absorb and share emotions is such a beautifully vulnerable and human thing. Sigh. Your book sounds absolutely fascinating, riveting and like a myriad of adventure of Parisian diversity. I have been to multiple countries with the UK and Bermuda and New Zealand and Australia being faves. On my bucket list is the lavender fields in France. Keen to read your book! Thank you for sharing. ps the captcha asked me to select all photos with palm trees. Ironic because I am writing from and live in Oahu Hawaii surrounded by palms everywhere.